Finding yourself in serious tax debt with the IRS is not an uncommon problem. Over 18 million Americans owe an estimated $458 billion in back taxes to the IRS (of which they only recover around 11%) and around 10 million consumers deal with tax penalties every year. Tax debt is the most difficult debt to tackle due to the amount of authority held by the IRS: they can seize your assets, hold on to your future tax refunds, garnish income from social security, retirement, and wages, or even take control of your bank accounts. 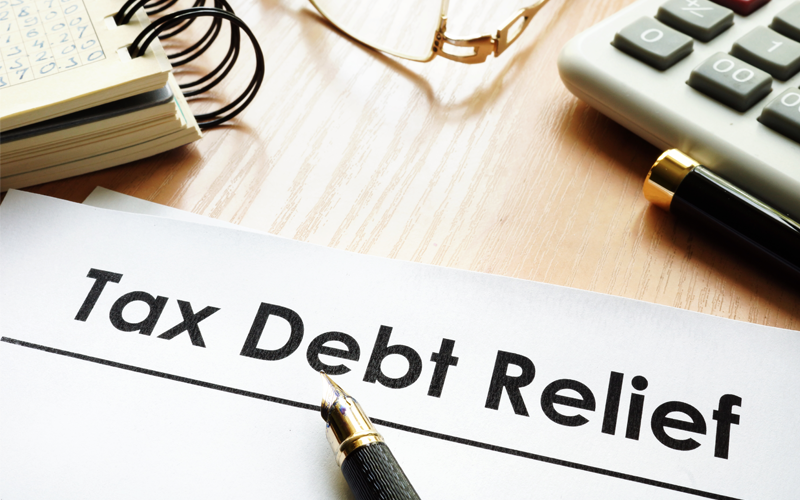 Though it may seem hopeless when you are struggling with tax debt, you do have options to reduce or completely eliminate it. Below, we show you some ways to handle your tax debt -- everything from repayment plans to settlements. How Did I End Up In Tax Debt? Unexpected expenses: You may have lost your job or had untimely emergencies and expenses pop up that make it impossible to pay off tax debt. Failure to file tax return: This is one of the most common reasons why consumers and businesses owe tax debt. When your income goes beyond the minimum requirement, it is illegal to not file a tax return. If you didn't file a return, the IRS files a Substitute for Return, which will only list your income and not any possible deductions, meaning you will owe a large tax amount along with penalties and interest. In other cases, consumers may have forgotten to file a state tax return, in which case the state files one on behalf of them (called an estimated state tax return). Any allowable deductions will not be taken into account and puts you in a higher income tax bracket. Incorrect tax return preparation: Your tax return may have been filed incorrectly and contain errors or a lack of information. Many consumers tackle their taxes on their own instead of hiring a CPA and don't have an in-depth understanding of the IRS or state tax code, resulting issues that are difficult to solve. Failing to make the correct payments: Businesses may not pay their quarterly Estimated Tax Payments during the year, which results in it accumulating at the end of the tax year. Tax audit: The IRS or state may audit your tax returns, which can result in additional taxes due to penalties or deductions that were not allowed in the first place. Choosing fewer withholdings: If taxpayers withhold less than they should, they wind up with more taxes to pay once they file their returns. Early withdrawals from retirement: Taxpayers under the age of 59 and a half are subjected to a 10% penalty for unqualified 401(k) IRA withdrawals. Many individuals are unaware of this rule and end up owing extra due to the tax penalty. What Can I Do About My Tax Debt? You can always take preventative measures to prevent or reduce unnecessary tax debt, such as budgeting, making sure you file quarterly (if needed), and always filing your taxes -- even if you can't pay. Keep in mind that if you don't file by the tax deadline, you could incur a 5% monthly penalty of unpaid taxes (which can reach a maximum of 25% of your balance). Even if you can't cover the entire cost, you should still pay as much as you can by the deadline in order to avoid penalties and interest. If you feel as though you don't have enough time to file a proper tax return, you can file for an extension. When in doubt, consult a professional. Even though you can handle your tax issues on your own, it's best to contact a CPA, certified tax resolution specialist, or IRS tax attorney to handle any serious situations. As long as you are communicating with the IRS in a timely manner, they will be more willing to work with you on resolving the issue. Installment agreements: You can work with the IRS to create a long-term payment plan. A tax attorney or specialist can negotiate a low monthly payment with the IRS on your behalf. Installment agreements are best if you need over 120 days to pay off your full tax debt amount and if you owe less than $50,000 with the included interest and penalties. Bear in mind that these payment plans can also add extra interest and penalties to your tax debt. A Partial Payment Plan agreement allows the taxpayer to pay a low monthly amount for 36 to 72 months. A Full Payment Installment Agreement allows the taxpayer to pay the full tax amount in a period of around 10 years or less. Other installment agreements include Complex Installment Agreements, Staggered Installment Agreements, and Streamline Installment Agreements. Delay Your Payment: You can temporarily delay your tax debt payment if you prove to the IRS that you won't be able to afford your basic expenses. However, you will eventually have to pay your debt with added penalties and interest. Offer In Compromise: If you owe more taxes than what you can actually pay, this may be the option for you. An offer in compromise can help resolve your IRS debt for less than what you initially owed but under certain circumstances. To qualify for this, you must be able to prove that paying the debt would cause financial hardship. OICs allow you to pay a lump sum or request a short-term payment plan from the IRS. Unfortunately, they are something that only a quarter of taxpayers are eligible for. Penalty Abatements: One-time penalty abatements are usually available for taxpayers who can pay their debt in full in a lump sum or through a monthly installment agreement. Taxpayers will only be able abate interest on abated penalties. Currently Not Collectible: If you are struggling with severe financial or personal hardships where you are unable to pay your tax debt, you may be able to ask for a deferment where the IRS may voluntarily agree not to collect your tax debt for a year (or more, depending on the circumstances) until your financial situation improves. You can file a collection appeal to explain how the situation can be resolved in order to stop an IRS levy, lien, seizure, or denial of an installment agreement. Collection Statute Expiration Date: The IRS will put a date on when your tax debt must be collected by, which is generally 10 years after the assessment date. This expiration date ends their right to collect the tax debt. Tax Lien Subordination: A tax lien subordination is an IRS agreement to get money from your assets in order to pay your tax debt. Bankruptcy: Filing for bankruptcy is one method to get rid of your tax debt, but this should only be something you consider as a final effort and only if your income tax debts are eligible. A Chapter 7 bankruptcy provides a full discharge of allowable debts while a Chapter 13 bankruptcy discharges some debts while providing a payment plan for the rest. Keep in mind that a bankruptcy results in a large amount of damage to your credit. Release Wage Garnishments: The IRS has the ability to levy your wages until your tax debt is paid off, the time period for collecting your debt expires, or until the levy is released. You may be able to ask for the release of a levy or change it if you can't meet your basic living necessities with it. Stop A Levy On Your Bank Account: The IRS can issue a levy on your bank accounts to collect tax debt, which means your bank account is required to collect the amount of the levy on that day and send it to the IRS within 21 days unless the IRS states otherwise. You can contact the IRS to obtain a levy release in order to resolve your debt. Innocent Spouse Relief: If you qualify for the IRS guidelines for innocent spouse tax relief, you may be able to avoid the tax problems from your spouse. There is no easy way to get out of tax debt but there is help. While there are scammers in the tax relief industry, you can contact a reputable tax relief service for a free consultation to find the best plan for you.